On a recent morning, I heard someone rustling outside the window. I went to see who or what it was, and confronted a pair of bare feet. With a smile in my voice, I said, "Buenos dias!" With his toes gripping bamboo, Edison “Pata Fresca” Montserrat and his coworker Miguel “Zapatudo” Angel smiled shyly, and then looked away. 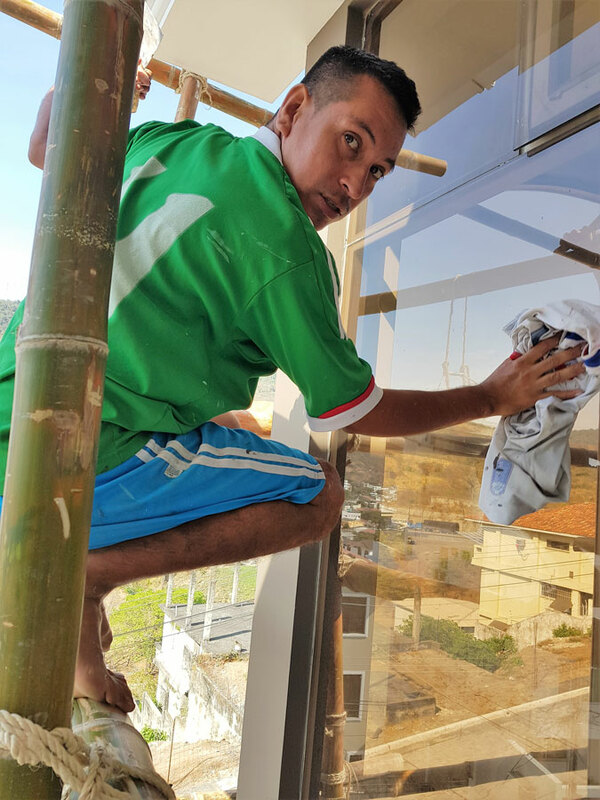 The two boys were erecting a bamboo scaffold to clean the windows on our condo in Guayaquil, Ecuador. Edison was taken aback by my comment, and reluctant to reply. But as our conversation warmed up, he told me that he felt much more secure on the scaffold being able to feel exactly where he stood, gripping the curvature of the cane with arches and forefoot; sensing the structure and its strength. Knowing where the cane (Guadua amplexifolia) is round and robust or oval and weak, and sensing the structural support by understanding the distance between nodes informed his body without the need to look at where he places his feet. Pointing at the cane, Edison pointed out that, where space between the rings is narrow, the cane is strongest. 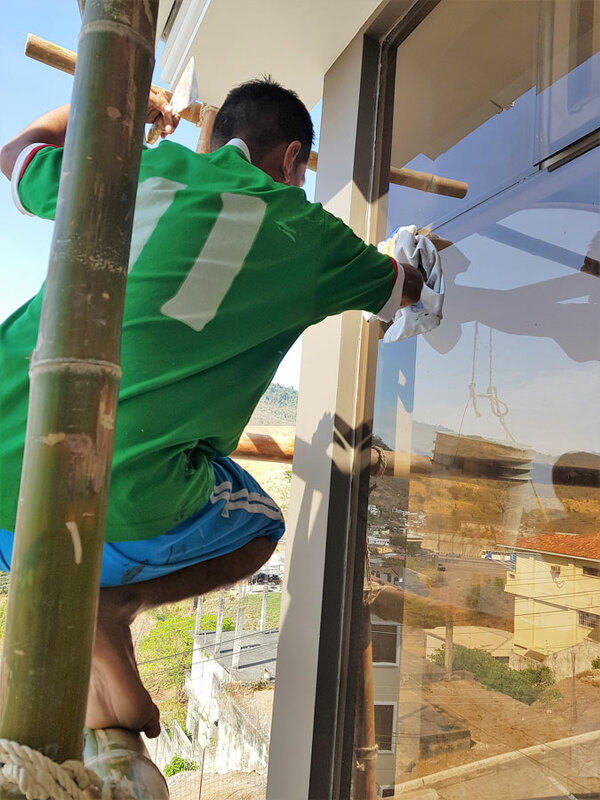 Bare feet allow Edison to detect a hairline crack in the material, which on a hollow, straw-like plank could make the difference between a productive day of work or falling—the long way down to the concrete below. His buddy, Miguel, wears shoes but climbs tentatively, "he’s just started the job," Edison told me. I Miguel if would take off his shoes someday, and he smiled, so shy, and said maybe. They both liked the nicknames I gave them, "Pata Fresca," of fresh foot for Edison and “Sapatudo,” kind of like calling him, “Big Boots” for Miguel. Latin Americans are big on apodos or quirky nicknames—many politically incorrect, like fatso and shorty. 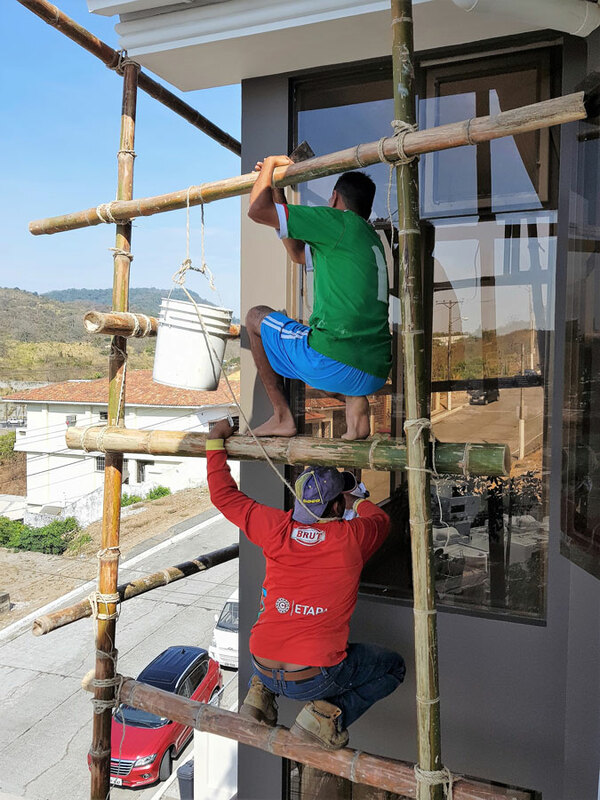 Edison taught me that cane scaffolding has a brief life, “…the cane is only useful for two jobs,” he said. 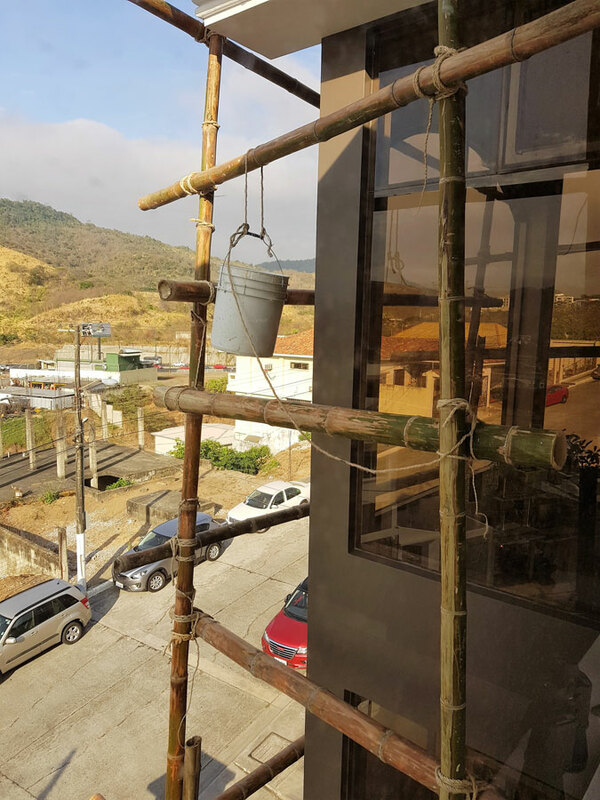 It’s still cheaper to erect disposable cane than to buy an extension ladder in Ecuador. “And how would you get an extension ladder to work?” Edison asked me. 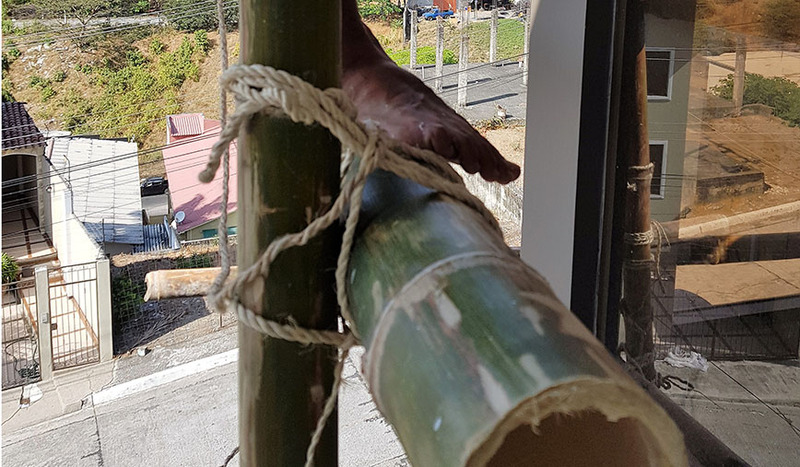 He comes to work by bus, bringing only hand tools and enough twine to tie the bamboo lengths into a climbing structure. A delivery truck drops the material off in the morning, and the garbage truck picks it up at days end. No, what follows is not a picture of how far Edison fell, thank God. 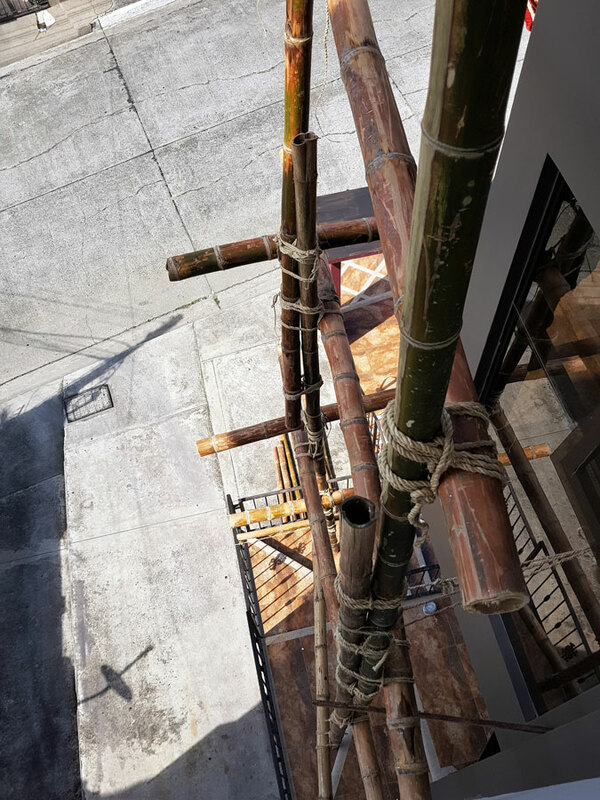 I just thought you’d like a closer look at the structural details of bamboo scaffolding. A few days later, I found myself on a step ladder changing light bulbs. Remembering Edison, I took off my shoes and socks. Climbed back up, and I admit it, I had a much keener sense of where I stood. When I took one foot off the ladder and placed it on a railing—leaning and stretching around a corner to reach a floodlight—my hands gripped the wall, my eyes remained trained on the light socket that perched up high, almost out of reach, while my body knew exactly how far I could step—the edge of the railing precisely and securely underfoot. Like a rock climber, I stood solidly balanced on the anterior lateral eminence of my left sole (I had to look that up, it’s the fleshy part right behind the big toe), and I felt secure knowing exactly where I stood. 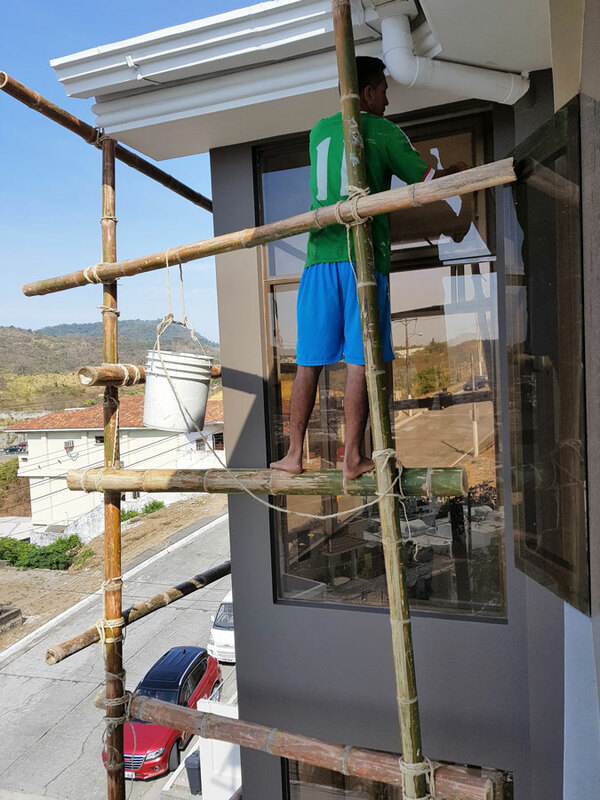 Edison, the barefoot bamboo climber, had a point. OSHA, take note.